With conditions from fresh to frightening, 14 teams from eight Yacht Clubs across the Solent and beyond, entered this year’s Interclub Youth Keelboat Nationals on Saturday 29th March for the Griffin Trophy, kindly donated by RORC. 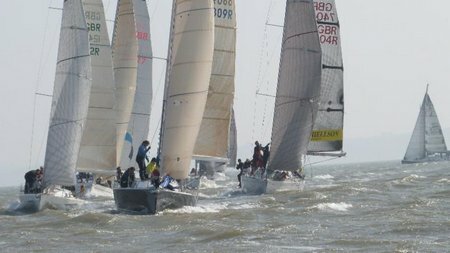 In brilliant sunshine and a solid 15-20kt breeze from the South East, all crews were tested with a variety of windward leeward and round the cans racing, including an experimental ‘Echo’ course incorporating a reaching start before a traditional windward leeward format, developed by Race Officer Stuart Childerley. There were a total of four races in the day, each very closely fought. The second edition of this event, again organised by the Royal Southern Yacht Club (RSrnYC) and supported by the RYA, was open to IRC yachts with a minimum TCC rating of 0.900 and not exceeding 1.085. The helm and 60% of all crew on board had to be 25 years or under. There were entries from eight clubs, namely, Parkstone YC, Royal Yacht Squadron, Hamble River SC, Beaulieu River SC, Poole YC, Royal Southern Academy, Royal Solent YC and the RORC Youth Team. Race 1 was a conventional windward-leeward race with the first boat completing the course in 45 minutes. On corrected time it was Peter Morton’s Salvo sailed by the RORC Youth Team, who took the first victory of the day by just 4 seconds from Premier Flair sailed by one of the Poole Yacht Club teams. The Royal Southern’s Academy team finished third, just 10 seconds adrift from second place. Clearly the Nationals were going to be closely fought. Race 2 saw the fleet head off around several fixed racing marks with the RORC and Poole Yacht Club teams ending up just 17 seconds between them on corrected time. Mitchellson Interceptor sailed by the Royal Southern Youth Academy finished third again just ahead of the Royal Yacht Squadron entry Yeoman of Wight. All crews were finding the conditions more challenging now as the wind increased to 17-20knots. Race 3 saw the race committee try a new experimental course. This involved a short reaching leg to a mark from the start, where the fleet then turned downwind and began a four legged windward-leeward course before reaching back across the finish line after rounding a windward mark for the last time. The feedback from the sailors was unanimously positive and the course provided an opportunity for the smaller boats in the fleet to be competitive on corrected time having been much closer to the front of the fleet in the initial stages of the race. The RORC Youth team eventually found their way through the fleet after a more conservative start to win on corrected time, leading home Esprit from and Beluga II Poole Yacht Club respectively. Induljence ,from the Royal Southern Academy, had their best race so far in the series finishing four ahead of Premier Flair V from Pool Yacht Club. Race 4 was another race around fixed racing marks with the finish line near to the entrance of the Hamble River. The RORC Youth Team won their third race of the series to take overall honours. The next four boats all finished within 17 seconds of each other on corrected time with Esprit, Beluga II, Induljence and Premier Flair respectively. The racing was good, competition was great and the RORC Youth Team are this year’s worthy winners, receiving the Griffin Trophy kindly donated by the Royal Ocean Racing Club (RORC).